The forced oscillation technique (FOT) is gaining clinical acceptance, facilitated by more commercial devices and clinical data. However, the effects of variations in testing protocols used in FOT data acquisition are unknown. 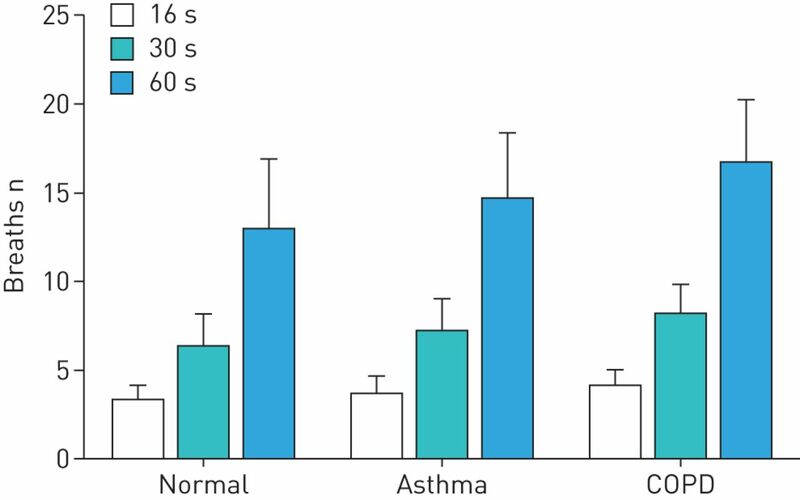 We describe the effect of duration of data acquisition on FOT results in subjects with asthma, chronic obstructive pulmonary disease (COPD) and healthy controls. FOT data were acquired from 20 healthy, 22 asthmatic and 18 COPD subjects for 60 s in triplicate. The first 16, 30 and 60 s of each measurement were analysed to obtain total, inspiratory and expiratory resistance of respiratory system (Rrs) and respiratory system reactance (Xrs) at 5 and 19 Hz. With increasing duration, there was a decrease in total and expiratory Rrs for healthy controls, total and inspiratory Rrs for asthmatic subjects and magnitude of total and inspiratory Xrs for COPD subjects at 5 Hz. These decreases were small compared to the differences between clinical groups. Measuring for 16, 30 and 60 s provided ≥3 acceptable breaths in at least 90, 95 and 100% of subjects, respectively. The coefficient of variation for total Rrs and Xrs also decreased with duration. Similar results were found for Rrs and Xrs at 19 Hz. FOT results are statistically, but likely minimally, impacted by acquisition duration in healthy, asthmatic or COPD subjects. The forced oscillation technique (FOT) is well established in research settings, with evidence that it provides physiological information about the respiratory system that is complementary to spirometry [1–3]. FOT measurements are useful for measuring lung function of people who have difficulty performing spirometry, such as those with severe lung disease, the elderly and children, since it requires tidal breathing without need for any forced manoeuvres [4–6]. Within-breath changes in FOT parameters, specifically differences between the inspiratory and expiratory phases, can be used to detect expiratory flow limitation during tidal breathing in chronic obstructive pulmonary disease (COPD) [7–9]. Furthermore, the technique is also being used in home monitoring of asthma and COPD patients [7, 10, 11], where a high degree of compliance has been achieved . With increasing clinical use, there is a need to optimise patient testing protocols, which would allow standardisation and improve the precision of FOT measurements. The effects of many aspects of FOT testing and measurement protocols on the final results remain untested. Current expert recommendations state that three to five tests should be performed [1, 6], but there are no recommendations for the duration of each test acquisition, either in relation to mean respiratory system resistance (Rrs) or reactance (Xrs), or in relation to within-breath analysis of those parameters. Indeed there is limited published data on how duration and number of measurements affect FOT results and its repeatability. While repeatability of FOT measurements is well reported [12–14], these values were acquired with different recording durations, ranging from 8–60 s across multiple centres. A paediatric study  has shown that within-session coefficient of variation (CoV) in children decreased with increasing duration of data acquisition. There are several factors associated with the duration of recording that might affect FOT parameters, including fatigue, which lead to altered posture or breathing technique, familiarity with the test (learning effect), number of breaths and respiratory rate. Thus, it is important to study different FOT acquisition times with the aim of informing protocols to achieve accurate and repeatable test results. In this study we aimed to compare total and within-breath FOT parameters, i.e. Rrs and Xrs at different measurement durations in healthy control subjects and in subjects with asthma or COPD. Our secondary aim was to compare the number of breaths and CoV for different acquisition durations. We hypothesised that duration does not significantly impact FOT parameters, but affects the within-session variability. This study was approved by the Ethics Review Committees of Concord Hospital and Royal North Shore Hospital (both Sydney, Australia). 20 healthy control subjects (male n=8) who had normal respiratory function and no respiratory disease, 22 subjects (male n=8) with asthma and 18 subjects (male n=12) with COPD were recruited at the Royal North Shore Hospital, Concord Hospital, and the Woolcock Institute of Medical Research (Sydney, Australia). The healthy control subjects and half of the COPD subjects were research volunteers, while the rest of the subjects were attending a respiratory laboratory for clinical indications. All patients with respiratory disease had the diagnosis of either asthma or COPD confirmed from a thoracic physician. Subjects were excluded if they had other known concurrent respiratory conditions. Participants were instructed to breathe in a relaxed manner on a tremoFlo C-100 (Thorasys Medical Systems, Montreal, QC, Canada) FOT device. After establishing stable tidal breathing, data was acquired continuously for 60 s, in triplicate. The default perturbation signal was used, which is a pseudorandom noise waveform spanning 5–37 Hz. Patients sat upright, wearing a nose clip, with the cheeks supported by their hands. Measurement sessions were completed within 15 min. Measurements were included in this analysis if no obvious cough, swallow or breath hold and no volume drift were apparent from visual inspection of the volume-time trace, and if their frequency spectra were not outliers compared to other measurements in the same session. If any of these events were identified, then that entire acquisition was excluded. No measurements were excluded due to high within-session variability provided above criteria were met. Using a developmental version of tremoFlo software (version 1.0.26.27; Thorasys Medical Systems), within-breath analysis was performed on the first 16, 30 and 60 s of each measurement to obtain total, inspiratory and expiratory Rrs and Xrs at 5 Hz and 19 Hz. Only whole breaths were included for the calculation of inspiratory and expiratory FOT parameters. We also examined the effect of duration on the mean values and on the within-session variability (measured by CoV) of the three measurements. Comparisons between durations were made using a Friedman test (non-parametric repeated ANOVA measures) followed by post hoc tests (Dunn–Bonferroni) in SPSS (version 20, IBM Corporation, New York, NY, USA). Comparisons between patient groups were made using Kruskal–Wallis (non-parametric ANOVA) followed by corresponding post hoc tests. Predicted values for FOT parameters were calculated from the values of Oostveen et al. .
Subject demographics and lung function are shown in table 1. Subjects with asthma or COPD were older and had a reduced FEV1 and FEV1/FVC ratio compared to healthy controls, with COPD subjects having the lowest FEV1/FVC ratio. Table 1 also shows FOT parameters for health, asthma and COPD using the default tremoFlo settings of 16 s. The FOT parameters for healthy control subjects were within normal predicted values. Subjects with asthma or COPD had a higher resistance and more negative reactance than healthy control subjects; however there were no differences in resistance or reactance between asthma and COPD. During the FOT measurement, subjects with COPD had an increased respiratory rate compared to normal or asthmatic subjects. With increasing measurement duration, there was a significant decrease in total and expiratory Rrs for healthy control subjects, decrease in total and inspiratory Rrs for asthmatic subjects, and an increase in total and inspiratory Xrs for COPD subjects at 5 Hz (table S1 and figure 1). However, the mean differences were small, i.e. less than 10% for all the above parameters. As expected, a shorter acquisition time captured fewer breaths (figure 2 and table S1). If we suggest hypothetically that three breaths or more would allow a reasonable estimate of within-breath parameters, then ≥30 s acquisition would allow a reasonable estimate at least 95% of the time. Mean of a) total respiratory system resistance (Rrs) and b) total respiratory system reactance (Xrs) measured at 5 Hz, calculated at different durations from three measurements in healthy (n=20), asthmatic (n=22) and chronic obstructive pulmonary disease (COPD) (n=20) subjects. *: p<0.05. Number of breaths per measurement stratified by measurement duration in healthy, asthmatic and chronic obstructive pulmonary disease (COPD) subjects. CoV: coefficient of variation; Rrs: total respiratory system resistance; Xrs: total respiratory system reactance. Similar statistically significant but small differences (<10%) were found for FOT parameters measured at 19 Hz. There was a decrease in total and inspiratory Rrs and increase in total Xrs in healthy controls, a decrease in total, inspiratory and expiratory Rrs and an increase in total, expiratory and inspiratory Xrs parameters in asthmatic subjects, and an increase in expiratory Xrs in COPD subjects at 19 Hz (table S2 and figure S1). The within-session variability of total Rrs and Xrs at 5 Hz over 30 s, as measured by median CoV, was 9 and 9% in healthy controls, 8 and 11% in asthmatic subjects and 6 and 9% in COPD subjects, respectively. Within-session variability tended to decrease with increasing measurement duration (figure 3). This was significant for: total Rrs in healthy controls, inspiratory Rrs in subjects with asthma and COPD, total Xrs in all groups, inspiratory Xrs in subjects with asthma and COPD, and expiratory Xrs in healthy and COPD subjects. The CoV of total and expiratory Xrs of 60 s measurements for asthmatic subjects was significantly higher than that of the healthy control group (p=0.02 and p=0.035); however there were no other differences between groups at any measurement duration. Within-session variability of a) total respiratory system resistance (Rrs) and b) total respiratory system reactance (Xrs) measured at 5 Hz and at different durations, as measured by coefficient of variation (CoV) for healthy (n=20), asthmatic (n=22) and chronic obstructive pulmonary disease (COPD) (n=20) subjects. *: p<0.05; **: p<0.01. The variability of Rrs measured at 19 Hz was similar to the variability at 5 Hz. The median CoV of Rrs at 19 Hz over 30 s was 6% in healthy controls, 7% in asthmatic subjects and 6% in COPD subjects, and did not change significantly with measurement duration. We did not examine the CoV of Xrs at 19 Hz because it is close to the resonant frequency, meaning both positive and negative values of Xrs close to zero were observed within groups, resulting in highly skewed distributions and difficulties in the interpretation of the CoV. Proportion of subjects with a coefficient of variation (CoV) for a) total respiratory system resistance (Rrs) or b) total respiratory system reactance (Xrs) at 5 Hz below a given threshold. There were also no significant differences found for total, inspiratory or expiratory Rrs or total Xrs in healthy, asthmatic or COPD subjects when the mean of the first two or three measurements were compared (tables S3 and S4). This remained the case whether we looked at 16, 30 or 60 s. There was a significant, but small, difference between one and three measurements for reactance parameters in healthy controls (expiratory Xrs at 5 Hz) and asthmatic subjects (total and inspiratory Xrs at 19 Hz) at 16 s only. Therefore, in this dataset, 2 acquisitions that were deemed to be acceptable based on the criteria of absence of breathing artefacts stated above would have produced the same mean parameters as three acquisitions. In this study, in which we examined the effect of acquisition duration and number on FOT measurements, we found that there were significant, but small, differences between total and within-breath FOT parameters from the first 16, 30, and 60 s of measurement. This applied to health, asthma and COPD. As expected, within-session variability decreased with measurement duration. At least three acceptable breaths were obtained in at least 95% of subjects within the first 30 s in all groups, with a mean number of acceptable breaths of at least six in all three clinical groups. In the context of the results of the present study, we discuss what an optimum duration for FOT measurements might be taking into account measurement accuracy, variability, number of acceptable breaths, and practicality. FOT parameters were found to decrease significantly with increasing measurement duration. However, the maximum difference in Rrs at 5 Hz in healthy controls was <5%, and the maximum change in Xrs in COPD subjects <10%, compared to the reported day-to-day variability of 6.5% for Rrs in healthy controls and 23.6% for Xrs in COPD subjects . In healthy controls, Rrs differed by up to 3% of the predicted value and Xrs changed by up to 1% of the predicted value. We, therefore, suggest that these differences are not clinically important. The largest difference occurred in asthmatic subjects, where the median total Rrs decreased by 10% between 16 and 60 s, compared to a reported day-to-day variability of 9.9%. However there were no significant differences between 30 and 60 s measurements. We suggest that the optimum duration of a measurement should take into consideration the number of acceptable breaths that are obtainable within that duration. This would be particularly important for within-breath analyses, where the entire breath is included or rejected to maintain balance between inspiratory and expiratory points . In children, Robinson et al. suggested that 16 s is too short to allow at least three breaths to be captured consistently. In the first 16 s, only 70% of healthy controls, 77% of asthmatic subjects and 85% of COPD subjects had at least three acceptable breaths. Fewer than three breaths may not be sufficient to recognise regular tidal breathing or artefactual breaths, or for within-breath analysis. It is possible that patients who are unfamiliar with FOT might breathe more consistently over 30 or 60 s, compared with only 16 s, even after an initial period to establish stable tidal breathing. This effect has been recognised previously, and a longer recording time was shown to be preferable to a “learning” time . From the results of the present study, we therefore suggest that at least 30 s of recording time is necessary to achieve at least three breaths in 95% of adult healthy, asthmatic and COPD subjects. We found that within-session variability of FOT parameters was reduced or remained the same for longer measurement durations, as might be expected. The within-session variability of Rrs was higher than previously reported values of CoV (4% in healthy controls, 7% in asthmatic subjects and 6% in COPD subjects), while the variability of Xrs was lower than previously reported values (19% in healthy controls, 22% in asthmatic subjects and 13% in COPD subjects) . However, previous values were collected using different FOT equipment, and represented a within-session repeatability averaged over multiple days excluding day 1, which was shown to have higher variability than subsequent days. The within-session variability of Rrs in the present study was, however, lower than previously reported between-session CoV in healthy controls (11%) and asthmatic subjects (10%) . When 30 s measurements were considered, the CoV of total Rrs was similar between healthy controls, asthmatic subjects and COPD subjects, and a given threshold would give a similar proportion of acceptable acquisitions across all groups. However, if a threshold CoV value was applied to total Xrs, the proportion of acceptable acquisitions using a threshold of 10% was higher for healthy controls than for COPD or asthmatic subjects. This suggests that resistance may be a better candidate than reactance to determine acceptability of measurements. In this study, we have chosen to analyse the first 16, 30, 60 s of measurements, instead of measuring patients for 16, 30, 60 s in random order. While this may contribute to a higher intra-class correlation between comparison groups, we believe the current study analysis design is more reflective of how the data would be collected in real life. In a separate study in healthy subjects in which subjects were measured in random order, our results did not differ (table S5). The healthy controls and half of the COPD subjects were research volunteers, while the rest of the subjects were attending a respiratory laboratory for clinical indications. Many of the healthy controls and COPD research volunteer subjects were familiar with the FOT test. This may influence a learning effect with subjects who are unfamiliar experiencing greater learning with each acquisition. We have previously documented a learning effect such that within-session standard deviation of resistance and reactance was reduced after day 1 . However, the CoV and mean Rrs and Xrs of the research volunteers who had COPD were not different from those of the subjects recruited from the clinical laboratory. Duration has a statistically significant, but clinically insignificant, effect on FOT results in healthy, asthmatic or COPD subjects. Within-session variability decreases with longer duration of measurement, which may favour longer acquisitions if CoV were used as a criterion for test acceptability. These results will help investigators choose a FOT measurement duration that balances having sufficient data for accurate test results and minimising within-session variability, while maintaining practicability by keeping the duration of the testing session short. We suggest that a minimum of three, artefact free 30 s measurements would allow accurate determination of within-breath parameters (as well as mean FOT parameters) in healthy, asthmatic or COPD subjects. Procedures to improve the repeatability of forced oscillation measurements in school-aged children. Respir Physiol Neurobiol 2011; 177: 199–206.
. Forced oscillation technique in infants and young children. Paediatr Respir Rev 2005; 6: 246–254. An official American Thoracic Society/European Respiratory Society statement: pulmonary function testing in preschool children. Am J Respir Crit Care Med 2007; 175: 1304–1345. A novel simple internet-based system for real time monitoring and optimizing home mechanical ventilation. In: ETELEMED 09 Proceedings of the 2009 International Conference on eHealthy, Telemedicine, and Social Medicine. Washington, IEEE Computer Society Washington, 2009; pp. 209–215. Home monitoring of within-breath respiratory mechanics by a simple and automatic forced oscillation technique device. Physiol Meas 2010; 31: 11–N24. The repeatability and validity of respiratory resistance measured by the forced oscillation technique. Respir Med 1989; 83: 111–118.